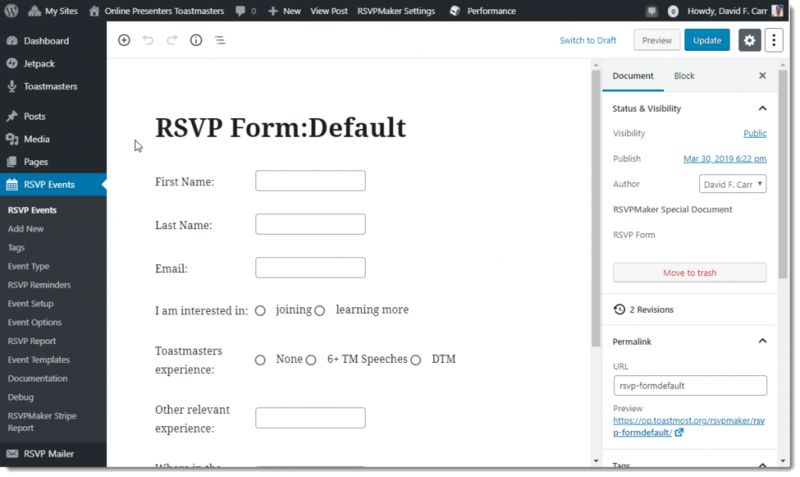 If you install RSVPMaker version 6.0+ and are running WordPress 5.0 or later, you will have the option of activating a new RSVP registration form that you can customize using Gutenberg, the new WordPress visual editor. One of the reasons I like Gutenberg is that it makes it easier to define visual components for content creation that happen to lend themselves well to many of my projects. 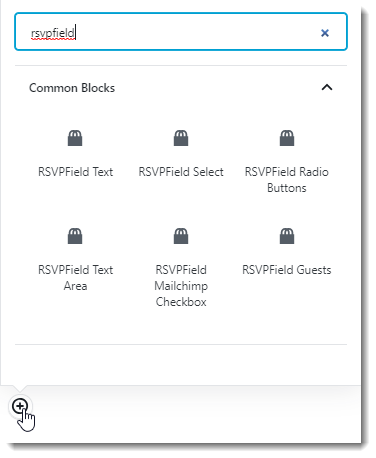 The new form builder makes it much easier to customize what fields are included, what the labels on those fields are, and the order in which they are presented, both for the person filling out the form and any guests included in their party. You can delete any of these fields and add others. You can determine which fields are required and which ones should also show up in the guest section (if you’ve included the guest section). Here’s an example of the default form for Online Presenters Toastmasters, a public speaking and professional development club that meets online and focuses on the skills you need to present online. There’s no guest section (that’s more appropriate for offline events like luncheons) but we gather some other information about our guests. The only field that is absolutely required is email. You can change the label on that one, but a validated email address is required or the form submission will not be processed. Previously, first and last name were also mandatory — and they are still required by default — but you can now specify that they are not required, or not include one or both of those fields on your form. I’ve had people ask for the option of creating simpler forms where they may ask for just the first name or just a nickname, or just an email address and nothing else. Again, that might be appropriate for certain informal online events or for attracting a privacy-conscious crowd. To see the available form components, type rsvpfield in the block chooser popup or enter /rsvpfield as a slash command on a blank line. Like all content blocks, these form builder blocks have options specific to their content type. Typically, those options will be displayed in the sidebar on the right hand side of the page (if you don’t see it, click the gear symbol and select the Block tab). You can embed other form fields in this section if there is information to be gathered about the guests only. Example: An event for parents and children, where “Grade Level” is an additional field for the children on the guest list. The Guests widget, with an additional field embedded for a question to be asked about guests, which will not appear on the main form. By themselves, these blocks are not functional if included outside of one of the special documents created specifically define a form. They are not intended for use within the body of an event post or any other document. I have some ideas about providing a wrapper that would allow you to embed them in other contexts, but for now if you are looking at a document with a headline other than “RSVP Form” you don’t want to be including these blocks. If you run into glitches with the form blocks not working as promised, let me know in the support forum on WordPress.org. Overall, I think this is a huge improvement over the system of shortcodes and the primitive form builder provided in earlier versions. 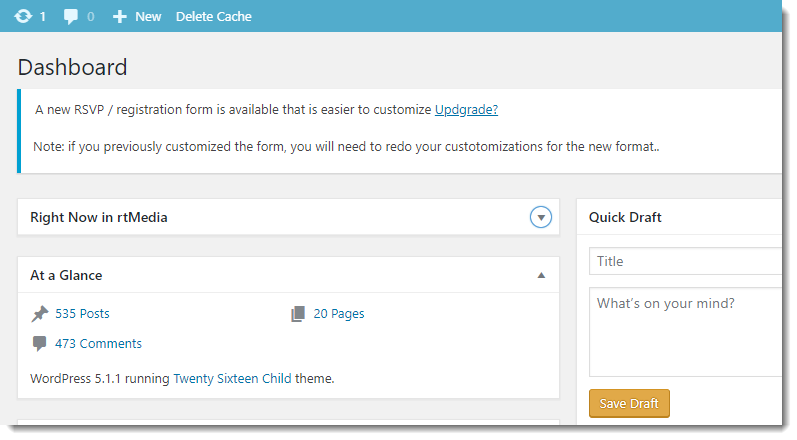 The new form will be used by default on new installs of RSVPMaker on WordPress 5 or greater. Existing RSVPMaker users will see a prompt to upgrade your form on the dashboard. Clicking the Upgrade link will install a new default RSVP Form:Default document, which you can then customize. This default will also be applied to any future events you have on your calendar. Sorry, any customizations you made previously will not be preserved, but I think you’ll find you can re-create them fairly quickly. 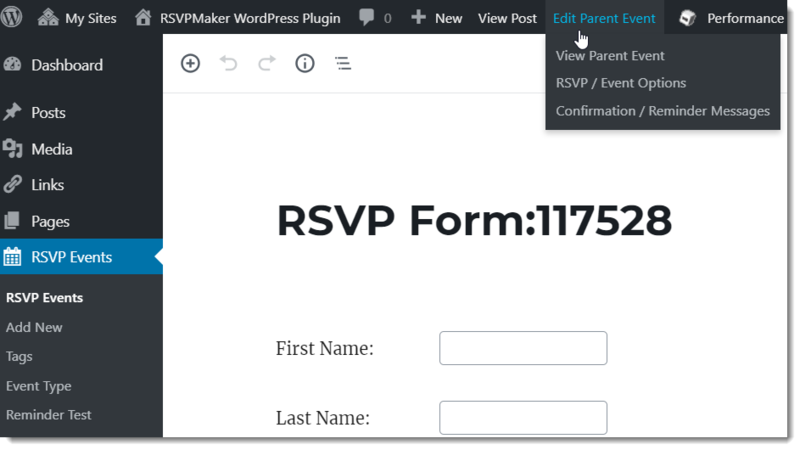 Your RSVP form, confirmation message, and any reminder messages you’ve defined are stored as special RSVPMaker documents that aren’t meant to show up on the website. 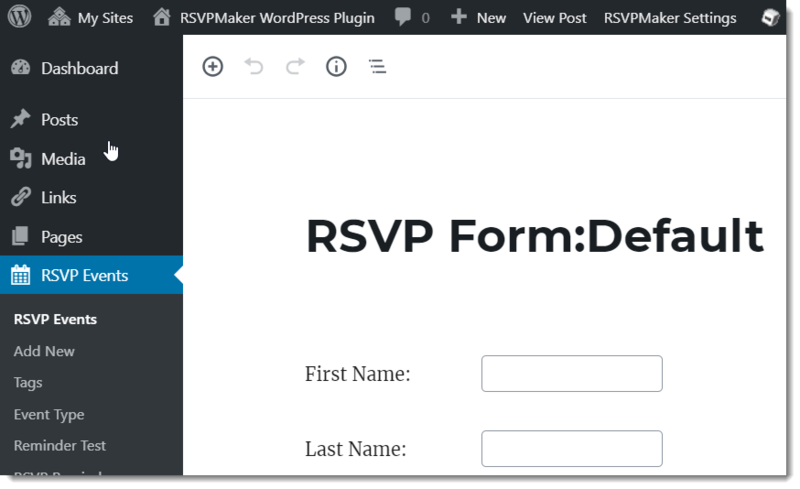 The default RSVP Form and confirmation message can be accessed from the Settings page for RSVPMaker. 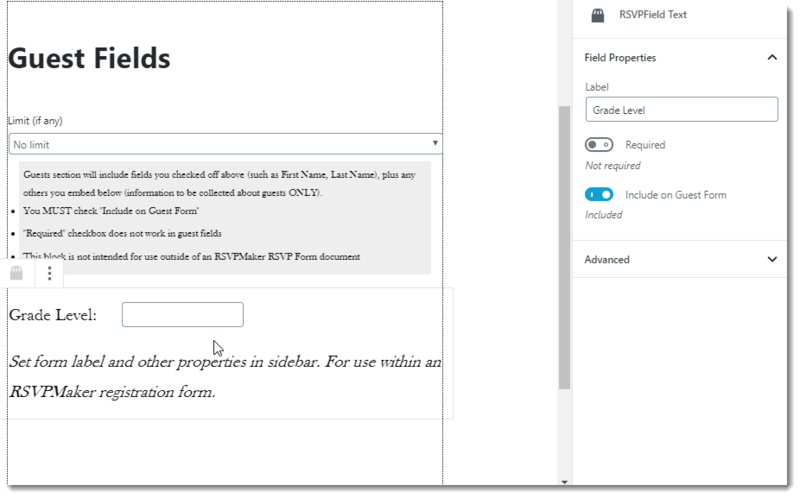 When you’re viewing one of these default documents, you will see a link at the top of the page to help you navigate back to RSVPMaker Settings. You can use the same default form for all your events, or you can customize the form for specific events. If you create a custom form (or confirmation message), you will see navigation at the top of the screen to allow you to get back to editing the “Parent Event” or visiting the associated screens for setting options and confirmation messages.